Developer: Hey, I'm adding a new admin page for transactions. Can you tell me how you want to search for transactions? Support: Sure, I usually just search by the username. Support: I sometimes also want to search by the user email address. Support: And the first and last name of course. Support: Well, sometimes I need to search by the payment voucher number. Support: Some customers send their invoices and ask questions so I search by the invoice number as well. Developer: OK, are you sure this is it? Support: Well, developers sometimes forward tickets to us and they use these long random strings. I'm never really sure what they are so I just search and hope for the best. Developer: These are called UUID's. Developer: So is that it? Django Admin search fields are great, throw a bunch of fields in search_fields and Django will handle the rest. The problem with search field begins when there are too many of them. When the admin user want to search by UID or email, Django has no idea this is what the user intended so it has to search by all the fields listed in search_fields. These "match any" queries have huge WHERE clauses and lots of joins and can quickly become very slow. Using a regular ListFilter is not an option -ListFilter will render a list of choices from the distinct values of the field. Some fields we listed above are unique and the others have many distinct values - Showing choices is not an option. We started thinking of ways we can create multiple search fields - one for each field or group of fields. We thought that if the user want to search by email or UID there is no reason to search by any other field. ListFilter allows for custom filtering logic. ListFilter can have a custom template. Django already has support for multiple ListFilters. What we want to do is have a ListFilter with a text input instead of choices. We create a custom filter for the uuid field - UIDFilter. 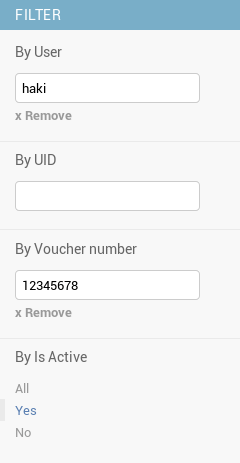 If the user entered a uid we search by transaction uid, payment uid or user uid. So far this is just like a regular custom ListFilter. # Dummy, required to show the filter. We use similar markup to Django's existing list filter to make it native. The template renders a simple form with a GET action and a text field for the parameter. 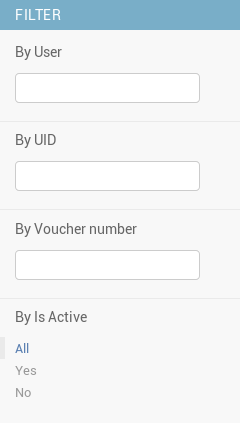 When this form is submitted the URL will be updated with the parameter name and the submitted value. So far our filter works but only if there are no other filters. If we want to play nice with other filters we need to consider them in our form. To do that, we need to get their values. The list filter has another function called "choices". The function accepts a changelist object that contains all the information about the current view and return a list of choices. # Grab only the "all" option. Now we have a filter with a text input that plays nice with other filters. The only thing left to do it to add a "clear" option. The complete code of admin.py can be found in this gist and the complete code of the tempalte can be found in this gist. You might have noticed that when searching multiple words Django find results that include at least one of the words and not all. For example, if you search for a user "John Duo" Django will find both "John Foo" and "Bar Due". This is very convenient when searching for things like full name, product names and so on.